Tourism is one of the key components of many GMS economies. Greater regional connectivity will provide the sector with a big boost, which in turn will catalyse job creation and economic growth. Mekong Trends is a public-private partnership that delivers valuable industry intelligence on specific and relevant topics. Owned and operated by CEN International and published for the industry on behalf of the Mekong Tourism Coordinating Office (MTCO) and National tourism Organisations of the six government of the Greater Mekong Subregion (Cambodia, PR China, Lao PDR, Myanmar, Thailand, and Viet Nam) Tourism in the GMS region has been transformed over the last decade or so, owing largely to a significant rise in disposable income and also due to the pro-liferation of a number of low cost carriers (LCCs) and a large number of new flight routes in the region, making travel easier and more affordable. 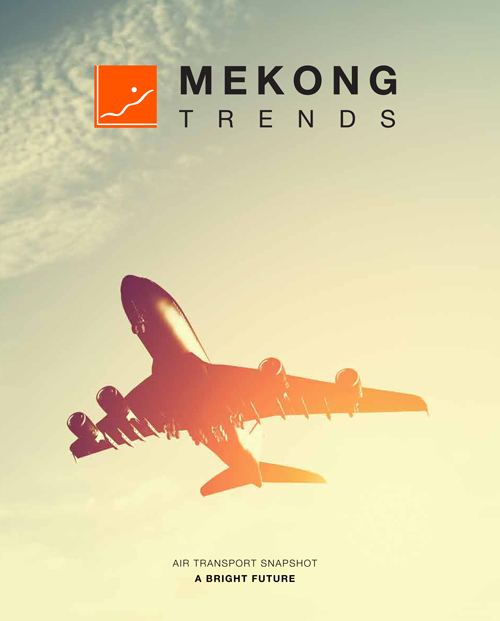 Download the first Mekong Trends Snapshot here. Thailand was the first GMS country to embrace the concept of an international aviation hub. Bangkok’s hub status started in the 1960s; far ahead of its main Southeast Asian competitors at the time: Singapore, Saigon (Ho Chi Minh City, Viet Nam), and Rangoon (Yangon, Myanmar). And it consolidated and grew alongside the Kingdom’s thriving tourism industry. The opening of Don Mueang International Airport Terminal 1 in 1981, coupled with the modernisation of Thailand’s national carrier, Thai Airways International, helped to position Bangkok as the Mekong region‘s hub, as tourism in Cambodia, Lao PDR and Viet Nam expanded during the late 1980s and early 1990s. Bangkok Airways emerged as a regional pioneer, contributing to the development of destinations in both Thailand and its GMS neighbours. In addition to opening up the Thai island Koh Samui, where it owned the airstrip, the boutique carrier also launched the first direct flight from Bangkok to Siem Reap, Cambodia in 1996. It was also the first carrier to fly international routes to Danang, Viet Nam; Luang Prabang, Lao PDR; and Nay Pyi Daw, Myanmar. Kunming International Airport in China’s Yunnan Province, is now the Mekong region’s second largest in terms of traffic. Serving close to 40 million passengers a year, Kunming is also the hub for China Eastern Airlines and is emerging as an important air bridge connecting mainland China with Southeast Asia. In Viet Nam, the expansion and modernisation of international airports in Hanoi and Ho Chi Minh City, as well as Vietnam Airlines’ SkyTeam global alliance membership and aggressive expansion strategy, are giving both airports, and the nation’s tourism assets, more global exposure. Having been a major contributor to the rise of international tourism in Cambodia and Lao, air transport is retelling the same success story in Myanmar. Please contact us through the below form.